Aural Hypnox welcomes Lingua Fungi to the label roster. Lingua Fungi has been working in the field of acoustic drone and ambient since 2001 and is run by J. Padatsu, who has during the years appeared in the Zoat-Äon live lineup and is currently member of Halo Manash. The fourth full-lenght album of Lingua Fungi, entitled ‘Melankhton’ is released through our Sublunar series. ‘Melankhton’ is a sonic interpretation of particular illness narratives and a study in experimental anthropology based on fieldwork material gathered especially for this project. The narratives and sounds expressing them reflect the shifting states of the turbulent minds visited by Melankhton. The album was recorded in 2006 using exclusively acoustic instruments and sound sources mixed with processed field recordings. The album consists of five long tracks with sounds varying from maniacal percussive rhythms to dreamy drone passages. 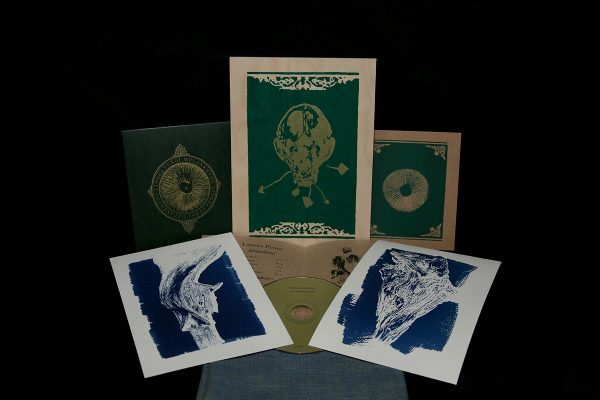 Melankhton deluxe box set is limited to 49 copies and includes the regular CD edition, 2 unique cyanotype prints and a silk-screen printed wooden panel carrying the essence of The Devourer – all housed inside a handmade cloth bag.